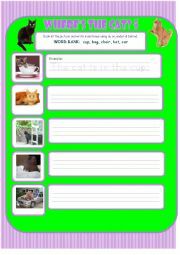 I have made 6 worksheets for young learners to practice “in”, “on”, “under” and “behind” using funny cat pictures (it’s amazing what cats can do!) 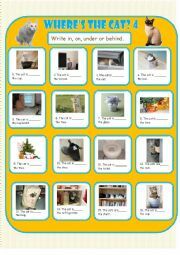 The fifth and sixth worksheets ask the students to write sentences based on the picture on the right using words from the word bank and the preposition. 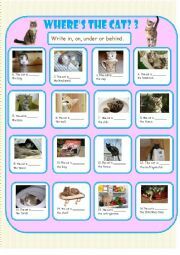 I have made 6 worksheets for young learners to practice “in”, “on”, “under” and “behind” using funny cat pictures (it’s amazing what cats can do!) 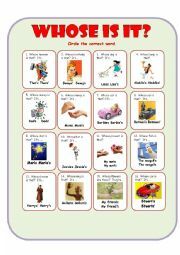 This fourth worksheet ask the student to write in the correct preposition. 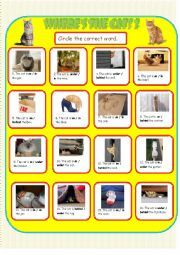 I have made 6 worksheets for young learners to practice “in”, “on”, “under” and “behind” using funny cat pictures (it’s amazing what cats can do!) 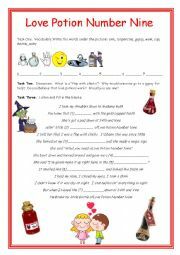 The first two worksheets ask the student to circle the correct preposition. 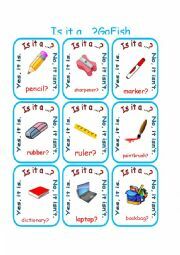 The third and fourth ask the student to write in the correct preposition. More coming! 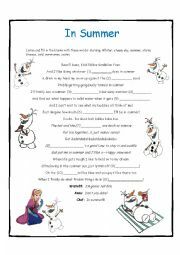 My students love this song from "Frozen". I use it to teach weather vocabulary. Listen and fill in the missing words. Key included. 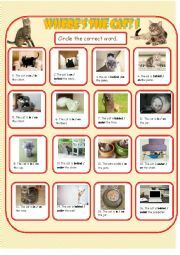 This WS has 3 tasks including pre-listening vocabulary, discussion and listening to the song. There are many versions of this song but I like the one by the Searchers. Key is included. Students read the sentence and circle the correct form of the possessive case. 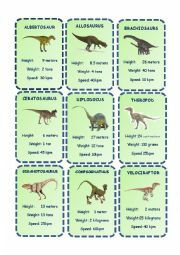 This game is for practicing the superlative form while learning about dinosaurs. Instructions are on page 3. Enjoy! Go fish game for beginning young learners to practice Classroom Objects, Is it ? questions and 3 part answers (Yes, it is/No, it isn´t). Full set plus instructions included.